Habitat: Hills of Bihar, West Bengal and Assam. Hilmochika or helencha is a bitter tasting creeper that grows by ponds and swamps and streams. Flowers are small and greenish in color. Intake of the cooked leafy vegetable reduces swelling of the body, any type of bile disorders, and is also a good purgative solution. 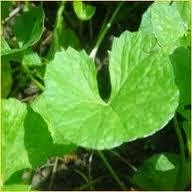 It is named as Chakrangi, derived from Atharva veda as it locks natural glow or brightness of the skin. Contributed by Barnali Dutta and the Indian Cuisine and Traditional Bengali Recipes. "Koi fish or climbing perch"
Anabas testudineus (Gangetic koi) possess a labyrinth organ. This bottom dweller insectivorous fish normally lives in slow-moving and often stagnant waters mostly in canals, lakes, ponds, ditches, floodplains, haors, baors, and swamps, flooded paddy fields or temporary pools which may dry up. When this happens, its "walking" skill allows the fish to move to other sources of water. It has the ability to use its pectoral fins to keep it upright as it makes a sort of wiggling motion with snakelike movements. Koi fish are very tasty and was easily available in older times. Now a days like many other fishes it is also rare in the local market due to the unavailability and the price factor. Peoples would like to cook a rich exotic solo fish curry like Koi Paturi or Tel Koi or Ganga-Jamuna or Koi Kamola rather than this leafy-fish curry. For this recipe, after thoroughly washing and cleaning with salted warm water marinate the climbing perch (koi fish) with salt, turmeric, and 1 tsp mustard oil (to avoid sputter during frying the koi fish), you may take 1 fish per person. Plant is rich in protein and is a good source of β-carotene..
Take Cumin and coriander seeds, 1 tsp each, 1 tsp turmeric, 2 red chilies, and 2 bay leaves, make a paste. Boil the whole plant and thus the extract is prepared, taken twice daily by a patient, results in the treatment of hand and leg swelling. This was usually a folk-medicine among the Rakhine, Chakma, and Marma tribal people. This plant is used in ascites, dropsy and anasarca. It is cooked with fish curry and taken to revive appetite after long weakness due to fever or typhoid.